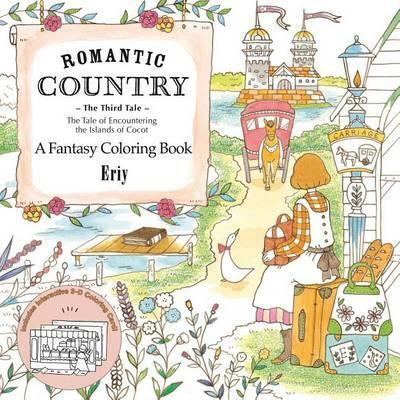 Cheerful rural villages, forests, lakeside scenery, and magical people await you and your colored pencils in this follow-up to Romantic Country: A Fantasy Coloring Book and Romantic Country: The Second Tale by Japanese illustrator Eriy, who uses an ink-dipped toothpick to draw each intricate design. Inside are pages and pages of provincial delights for you to bring to life through coloring: magical forests filled with fairies, delightful town squares bustling with people, whimsical village scenes, charming castles with towers--and so much more, sure to delight people of all ages. Romantic Country: The Third Tale will whisk you away to a black-and-white fantasy land that you can bring to colorful life. Cheerful rural villages, forests, lakeside scenery, and magical people await you and your colored pencils in this follow-up to Romantic Country: A Fantasy Coloring Book and Romantic Country: The Second Tale by Japanese illustrator Eriy, who uses an ink-dipped toothpick to draw each intricate design. Inside are pages and pages of provincial delights for you to bring to life through coloring: magical forests filled with fairies, delightful town squares bustling with people, whimsical village scenes, charming castles with towers-and so much more, sure to delight people of all ages. Romantic Country: The Third Tale will whisk you away to a black-and-white fantasy land that you can bring to colorful life.